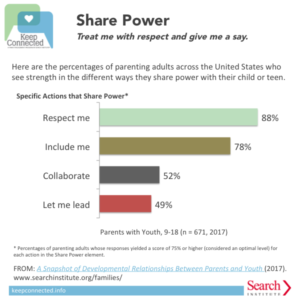 Some people are surprised to see “share power” as a core feature of parent-child relationships. Yet the ways families deal with power struggles lie at the heart of kids becoming responsible, how conflicts are resolved, and the overall quality of our relationships. At its heart, “sharing power” highlights the ways we influence, learn from, and work with each other through our relationships. What’s challenging is that how we share power constantly shifts as kids grow up. What’s exciting is that we discover new things about ourselves and each other when we share power and learn from each other. What Does It Mean to “Share Power”? Respect me: Take me seriously and treat me fairly. Include me: Involve me in decisions that affect me. Collaborate: Work with me to solve problems and reach goals. Let me lead: Create opportunities for me to take action and lead. Let them pick shared activities. They can sometimes decide what you’ll do together and what you’ll talk about. Don’t jump in too fast when they don’t make quick decisions or think of things to talk about. Sometimes it helps to let them pick from two to three choices that work for the schedule and budget. Learn from your kids—and show it. They often have a lot to teach us as adults. Let them know when you’ve learned something from them that you’re excited about. Take time to understand each other’s point of view when you disagree. If you can, reach a consensus or compromise. If you come to agree with them, admit it and celebrate their persuasiveness! When you need to make a decision that your kids disagree with, explain your final choice to them. Thank them for taking time to share their perspective. Collaboration is at the heart of sharing power. Download these tips for collaborative decision-making in families. “More power” isn’t the same as “all power.” Though parents have more power in parent-child relationships, our kids also have—and need—power in our relationships. Discovering how we share power in our relationships and encouraging kids’ power to grow as they mature is a core task of parenting. With power comes responsibility. This means treating children with love, respect, and fairness without manipulating, coercing, or threatening them in ways that harm them or our relationship. This abuse of power can include physical or emotional violence or manipulation, including withholding affection or approval in order to get our way. If we want kids to become responsible, they need to learn to use power. They need opportunities to make choices, work through problems, make mistakes, and learn from their actions. Otherwise, they will not develop responsibility. We must let go for them to grow. Sharing power happens in different ways for different families and different kids in different places and cultures. Do what fits best for your family right now. Take a quick quiz to reflect on how you share power in your family. Use the results to explore new ways to share power and work together. How Do We Influence Each Other? Family members have a great deal of influence over each other: Parents influence kids. Kids influence parents. Siblings influence each other. Grandparents influence grandkids. Grandkids . . . you get the idea. All of these “influences” are, in some sense, a form of power we have in each other’s lives. Families are stronger when they’re intentional in the ways they share power with and influence each other. Use these discussion prompts to start conversations about how you intentionally use or share power in your family. What does the word power mean to you? What attracts you to the word? What worries or turns you off about the word? What are the ways each member of your family influences others in your family? This can include personal preferences (such as fashion or music preferences), how your family spends time and money, and core beliefs and values. Look at each of the areas of sharing power, including the ways family members respect, give voice to, respond to, and collaborate with each other. When are some times when you’ve done some of these things well in your family? Which are particularly hard for your family? When is a time you’ve been thankful someone has used their “power” to help you? When is a time they’ve shared their power with you that you’ve really appreciated? How are the “power dynamics” in your own family similar to and different from previous generations in your family or other families you know? What might be some of the reasons behind those similarities and differences? If you were to identify one area of sharing power that you’d like to work on in your family, what would it be? Why? How does the idea that sharing power is an important part of family relationships strike you? What parts of it make the most sense? What doesn’t make sense? When have you found great satisfaction as a parent by sharing power with your child? What gave you that satisfaction? 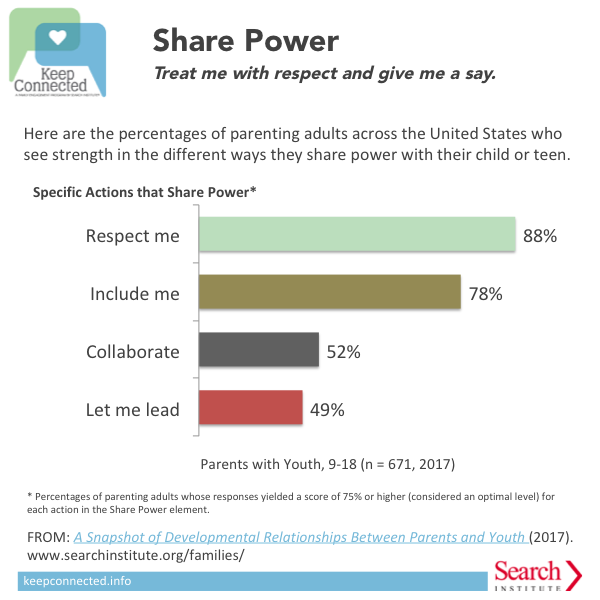 What’s hardest for you about sharing power with your child? How have you managed the hard parts? What are some ways you’ve seen families effectively share power when their kids are different ages, from infancy to adulthood? At what ages can it be most challenging? What advice would you have for parents of younger kids when it comes to sharing power in the family? Families are stronger when they are intentional in how they share power with and influence each other. These activities give your family a chance to think about the ways you do or don’t share power—and how you might strengthen this area of family life. It can seem easy to respect someone—when they do what we think they should do. Or when they do something we greatly admire. Or when we feel close to them. Or when they’re super-talented or achieve a big goal or milestone. But how does respect work in the everyday ups and downs of family life, where we know each other—warts and all? How do we take each other seriously and treat each other fairly on a day-to-day basis? These activities give you a chance to explore these questions together. We see respect and disrespect all around us. What do we learn from it? Whether we consume television, social media, movies, or advertising, we see countless examples of where people respect—or disrespect—each other. Go to a movie or watch a TV show together. Have each person look for examples as they go through their day. Just think back over the past week for examples you remember. What were some of the most obvious examples of respect? Disrespect? Why do you think the people in the examples you found respected the people they respected? Do you think those were good reasons? Similarly, why did people disrespect others? Were those good reasons? Which examples reminded you of your own family? In what ways? If they were to do a news story about respect in your family, what examples would you want them to highlight? Perhaps you found some examples that inspired your family to be more intentional about how you show respect to each other. Brainstorm ways you might do that. Talk about how family members understand and experience respect. This activity gets your family talking about the ways other family members show respect to each other. Give each person a notecard or a sheet of paper. Have each person write their name on the sheet, then pass it clockwise to the next person. Once everyone has written down their idea, pass it clockwise again. Repeat the process. Keep going around (skipping the person whose name is on the card) until you run out of examples of how people show respect to each other. Then give the cards back to the person whose name is at the top. Have them read aloud what’s written on the card for them. Talk about what you each saw on the cards about you. Were there any surprises in what was written about you? Anything missing that you expected to see? How much do the ideas reflect your experiences in your family? What might enhance the ways you show respect for each other in the future? What’s one small thing you’ll try to do differently based on what you learned? Tell the world: If you like, pick one or two of your favorite examples of how family members show respect, and write it with markers on a large sheet of paper. While holding up the sign, take a selfie together with the person who demonstrates respect. Post the photo to your favorite social media site. As kids grow up, they typically want more and more of a say in decisions that affect them.2,3 Those realities require us to revisit how we share power as our kids grow up. These activities give your family a chance to explore ways to include everyone in decisions, including how to negotiate through differences. Explore how family members experience differences in who decides what in the family. You—Someone else in the family decides it (not me). Read one of the “who decides” prompts in the list below. Who decides . . .
What the family will eat when you have meals together. What to listen to (if anything) when you’re in a room or car together. How you style your hair or what clothes you wear. People’s chores or responsibilities at home. How much time (and when) you can use a cell phone, tablet, video game, or other electronic device. What your family does for fun together. Whether and when you participate in religious or cultural activities. When or whether kids do homework. Why they picked where they’re standing. Give examples. Whether they think this is the best way to make these decisions in your family right now. Why or why not? Is the mix of who makes the decisions working well for our family? If not, what might you change? Are there more areas where you think it would be good for your family to negotiate and decide together? What would those be? How might some of these patterns could change in the future? Why? In the next few days, listen for examples of when and how your family makes sure people have a voice and how you make decisions together, either large or small. A step-by-step process for working toward solutions that work for everyone. For each person to have a voice and share power in families, you need ways to work through disagreements—besides always reverting to “Because I said so.” This activity guides you through a simple negotiation process. Identify an area of tension (start with something small), and try these steps to work through it together. Describe the issue at hand, as you understand it. Ask others to clarify it from their perspective. Again, insist that people don’t get into a “blame game” or assume that they have the solution. Work together to come to an understanding of the problem that everyone agrees is accurate. Brainstorm things that are contributing to the problem. These can include things people do, things about the circumstances, and any other issues. Agree together on a shared and specific goal. Make it a goal that everyone really cares about. Make sure you all understand what’s in it for the other people. Next, brainstorm a bunch of ways your family could tackle that problem, based on what you think contributes to it. Take turns thinking of ideas that would involve both individuals and the family as a whole. Don’t debate them yet, but try to get lots of ideas out (at least three ideas per person). Evaluate your ideas. Which few seem to have the best chance of making a difference? Combine them and refine them. Think of the pros and cons, including how likely it is that each family member will actually be able to do it and stick with it. Highlight ideas that involve everyone and that everyone believes can work. Work together to pick one or two things you’ll do together (or each person will do) that work for everyone. Talk about how you’re going to check in on how it’s going. Also think about what you’ll do if people don’t follow through. After a few days, check in with each other to see how it’s going. Adjust, if needed. You can even go back to your longer list of ideas to try something else. If you’re still stuck, have another brainstorming session to come up with more ideas. Once you’ve tried (and refined) these steps for smaller challenges, your family will be ready to try this process on other challenges you face. A dictionary defines collaboration as “working with another person or group in order to achieve or do something.” For families, it means learning and solving problems together. A lot of those things happen in our families—from working together to go to school and work each day to working together to figure out how kids can be their best. Figuring out when to collaborate and when to “just do it myself” can be hard. In these activities, your family works together to learn how your family collaborates, including how you work through conflicts together. Sometimes families collaborate. Sometimes they don’t. What works for your family? How does your family make decisions and get things done? The answer, probably, is: It depends. It depends on the topic, the time, the circumstances, and other things. What works for some families won’t always work for others. Tell me what you think, but I’ve decided what we’re doing. Here’s what we’re doing. Got it? I’ll use your ideas when I decide. Let’s talk about it, then you decide. As a family, think about family decisions, big and small, that your family has made in the past week or month. These could range from what you have for dinner to whether to move to a different home, state, or country. The decisions can be serious or funny. Keep identifying decisions until you get at least 20 tokens on sheets—or until you run out of ideas. Do the labels with the most tokens reflect how your family makes decisions in everyday life? Explain. Do the patterns you see reflect what you think is good for your family? If so, why? If not, what would you change and why? Where might there be more opportunities for your family to collaborate on making decisions or getting things done? Did most of the tokens go where one person wanted them to go, or did everyone have an equal voice in where you put the tokens? Did that experience reflect what typically happens in your family? What ways you make decisions or get things done could be more collaborative, with all family members having a meaningful say in them? Think together about what you might do in the next week to experiment with collaborating more on some everyday decisions. See how it goes and whether it might become a part of the way your family gets things done. If you’re stuck, check out these tips on collaborative decision-making. Which one might help your family? Use the idea of a relay race to talk about ways your family has collaborated to help each other grow. In a track-and-field relay race, members of a team take turns running a leg of the race carrying a baton. Each runner then hands off the baton to the next runner within the exchange zone. The exchange zone in a relay is a useful way to think about sharing power and collaborating in families. In many areas of life, parents are the first to “run” with all the responsibility. Then they enter an exchange zone where they coordinate and collaborate as they pass the baton. Then the kids in the family “run” with the responsibility. There are some important differences, of course. In life the exchange zone is much longer, and it’s not clearly marked. Also, in collaboration, you’re not limited to a “blind handoff,” like sprinters do; it’s more like a long-distance relay where there’s more time for the exchange. Find a stick or ruler to serve as a runner’s baton that you can pass around during this activity. Start by giving the baton to a parent, who talks about an early memory about beginning to collaborate in making decisions and taking responsibility with one of their children. (Early decision-making might include things like deciding which socks to wear.) What do they remember about how that went? They then pass the baton to that person, and repeat the “relay exchange.” People may talk about times they either “received” the baton or “passed it on” to someone else. Go around as many times as you’d like. What, if anything, did you notice about how people describe their exchanges? Were they fun, hard, confusing, or a mix? Exchange zones are part of the rules of relay races. Why do you think they’re important in families? What are things you do (or could do) together in these exchange zones that make for a smooth handoff? What are some responsibilities or decisions you’re working together on now? What insights from this activity might help that go more smoothly? In relay races, the runners often have a verbal signal (they may shout “stick!” or “hand!”) to let the other runner know it’s time to begin the exchange. What are signals you give when it’s time for someone else to reach out to take a new responsibility? What might work for your family? Finally, unlike relays where you can perfect the handoff, growing up and collaborating is much less controllable and requires lots of give and take. How can your family stay supportive, even when the “exchange” isn’t going smoothly? How do you let go to grow—and hold on at the same time? Some young people may be reluctant to try new things or take on responsibilities. Kids feel pushed beyond their comfort zone, and parents become exasperated! Either way, conflict, frustration, or worry can strain relationships during these times. How do we share power and collaborate when we disagree or have conflict? Put another way, how do we maintain a healthy, positive relationship even as we’re working through hard issues and changes? This activity is designed to help you practice when the conflict isn’t as emotionally intense. It helps your family think through how you’ve handled these conflicts in the past—and what you’d like to try moving forward. Make sure everyone feels comfortable. Set a positive tone for the conversation. For example, each person could talk about one thing they’ve enjoyed in the past week or one thing they’ve appreciated about someone in your family in the past week. Identify a recent incident when you had a family disagreement or conflict about responsibilities or decision-making. Use this incident as the “case study” for this conversation. NOTE: It’s better if the incident was resolved adequately so you’re not still trying to resolve it when you’re trying to understand it. Once you’ve practiced with some incidents that have been resolved, you can use some of these processes to work through unresolved issues. Clarify the purpose of this conversation—to examine a recent family disagreement so we can get some new insight about the process we use in our family for resolving disagreements. We’ll be talking about how we deal with disagreements, not trying to resolve specific disagreements. Also, the purpose is not to assign blame or to rehash the conflict. Rather, we want to learn some things together that can help us resolve disagreements better in the future. We’ll highlight both what worked well and what didn’t. What was the conflict or disagreement about? Was the specific issue the real disagreement, or was something else going on? Where were you? Who else was there, if anyone? Was something else going on that affected the issue? What were you feeling while all this was going on? Work together to come up with a shared summary of what happened that includes each person’s perspective and experience. How did people deal with their emotions during the conflict? How did they deal with other people’s emotions? Listen to each other and ask clarifying questions. Show concern or empathy for the other person, even while disagreeing. Set aside distractions (such as cell phones) to give others your undivided attention. Restate the conflict from the other person’s perspective. Get mad, shout, or try to use your power to get your way. Avoid conflict by giving up or giving in without expressing yourself. Get distracted and not stay focused on the issue. Freeze up so you can’t really deal with it at the moment. When you have at least 15 or 20 ideas, work together to identify and circle three or four issues that would, if addressed, make a big difference in working through family conflicts about responsibilities and shared decision-making. Focus on areas that everyone can work on together to improve so it’s a shared responsibility. Brainstorm ideas of what you can do the next time to address these areas. Post these ideas on your refrigerator or another place where you’ll all see them. Revisit them from time to time as reminders; update them when you need to. What are you personally going to work on the next time there’s a disagreement about responsibilities and decision-making? What are you most hopeful for about how our family will deal with conflicts the next time? Each person in the family can be responsible for leading some part of family life. Some may be big things―like deciding where to live, major investments, and overall family priorities and values. Other everyday roles can also be opportunities to lead, even in small ways, such as planning meals, organizing an outing, or thinking through the weekend schedule. These activities explore how everyone can take on leadership roles that fit who they are and help them grow—while also helping the family stay on track. Review your week of activities to discover ways everyone does—or could—lead. Sometimes we get so caught up in doing everything the way we always do it that we don’t stop to think about how we might adjust to give someone else a chance to try something new. This activity encourages your family to do just that. For each family activity, decide together who was the “leader” for the activity. That is, who decided whether to do it and made sure it happened? Mark each activity with that person’s color, symbol, or initials. If two or more people decided it equally, include all their markings. Look to see if there are any big gaps on the sheet when no one made clear decisions. Are there other major activities you’d add? Do some family members lead many more activities than other family members? Does all that “division of labor” make sense? How would you explain the differences? Could some areas shift? What might you try? Find one or two areas of responsibility or leadership that someone in the family with fewer responsibilities could try leading a couple of times. See how it goes. What did you notice about yourself as you made the shift (particularly if you took on more responsibility or gave up responsibility)? What was it like to share power in this way? What worked well? Why? What didn’t? If you were to keep doing this, what would you do to keep it going longer? What would make it more successful? What did you learn from this experience about sharing power? How did it affect your relationship? Your views of yourself? Explore what it means to be someone who leads with relationships. Sometimes we think of leaders as being strategists. But some of the best leaders lead through relationships. Just as relationships are the basis of strong families, they can be key for being a leader. This activity helps your family think about the relational qualities you value in leaders in your home and in your lives. As a family, identify two to three leaders you all admire. (Think of ones you know some specific things about, not just ones you know vaguely.) They can be both people you know personally and famous people. Talk together about what you admire and respect about them. 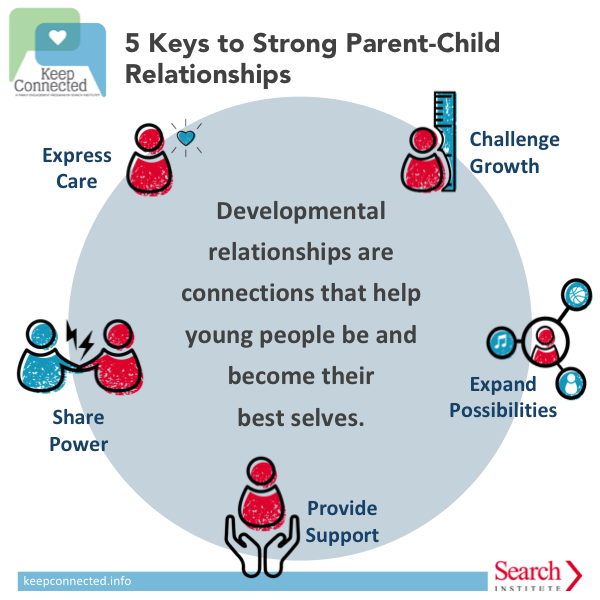 Download or print the five elements of developmental relationships from Search Institute, a list that identifies five aspects of relationships that help young people learn and grow. These qualities may also be relevant for “relational leaders” who bring out the best in those they lead. Now, have each person try to think of qualities one of these admired leaders have that fit with the elements of the relationship framework. The trick: Each person needs to think of the number of qualities to match the number of pieces of candy or snacks they took. (So if they took eight M&Ms or chips, they need to think of eight qualities of that person that fit the relationship categories.) Then they can eat their snack. Continue until everyone has had a turn. If anyone struggles for ideas, encourage others in the group to name a relational leadership quality in that person instead. How much do you think it matters that leaders exhibit these five qualities? Are there other things that are more important? Which of these is most important? If someone were to describe you as a leader, what qualities do you hope they would list? What do you think it means to be a leader in our family? Do you see yourself as a leader in our family? Why or why not? In what ways would you like our family to help you grow as a leader? What would different family members like to lead? One way to take on a leadership role is to start something new. Why would we do it (benefits, value)? Have the person call a family meeting to present their idea to the whole family. Provide encouraging feedback, and work together to follow through with the plan. After the event, have another family meeting to talk about how it went. What did you most enjoy together? What was it like to lead something for the family? What would you do differently the next time? What Does It Mean to Share Power? Respect each other: Take each other seriously and treat each other fairly. Include each other: Involve each other in decisions that affect them. Collaborate: Work together to solve problems and reach goals. Let everyone lead: Create opportunities for all to take action and lead. How Do Families Share Power? U.S. parents are much more likely to say they respect their children and include them in decisions than they are to say they collaborate with them in solving problems or giving them chances to lead, according to Search Institute research. 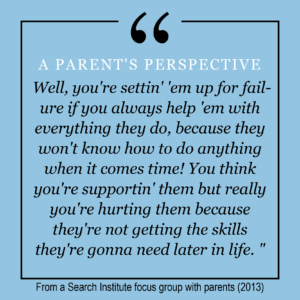 For more research on providing support in family relationships, check out Search Institute’s research on families. 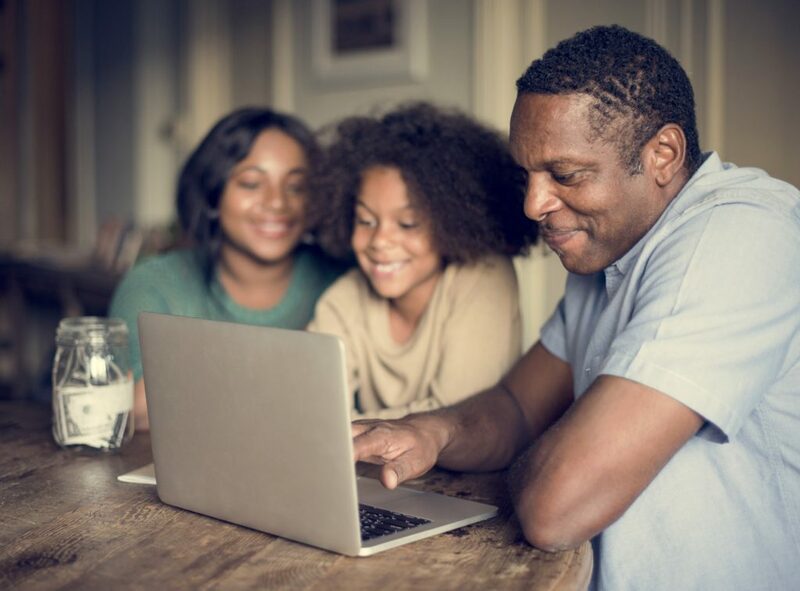 Take the Share Power quiz to explore the ways you share power in your family. How power is—or is not—shared lies at the heart of every relationship. Sharing power with children helps prepare them to be responsible adults. It also shapes the quality of our relationship with them as they grow up. Sharing power recognizes young people’s increasing ability to think critically, make decisions, and have a voice in family life (and other areas of life as well). This leads to more give-and-take in the relationship, with each person influencing the other. But that’s not always a smooth process. Sometimes kids think they’re ready to make some decisions or be more independent than parents think is appropriate. These mismatched expectations can create conflicts and undermine closeness until relationship roles and expectations adjust. Serious, ongoing conflict is not inevitable. Only about 5 to 15 percent of teenagers have extremely conflicted relationships with their parents.2 For most families, conflicts over power and independence increase during the middle school years, then begin to even out or decline through high school as new, more egalitarian, patterns take shape. 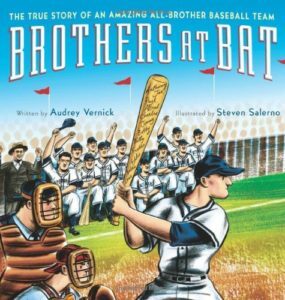 Get the Book For your school or organization. 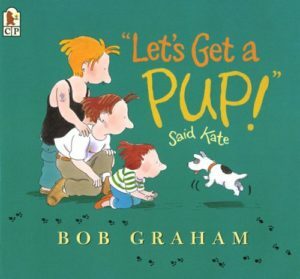 For your family, or visit your local library. Kuczynski, L. (2003). Beyond bidirectionality: Bilateral conceptual frameworks for understanding dynamics in parent-child relations. In L. Kuczynski (Ed.). Handbook of dynamics in parent-child relations (pp. 3–24). Thousand Oaks, CA: Sage. Laursen, B., & Collins, W. A. (2009). Parent-child relationships during adolescence. 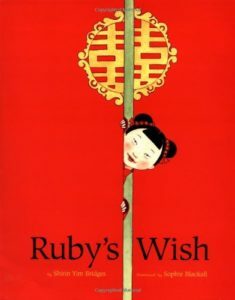 In R. M. Lerner & L. Steinberg (Eds. ), Handbook of Adolescent Psychology: Vol. 2: Contextual Influences on Adolescent Development (pp. 3–16). Hoboken, NJ: Wiley. Lowell, A., Renk, K., Adgate, A. H. (2014). The role of attachment in the relationship between child maltreatment and later emotional and behavioral functioning. Child Abuse & Neglect 38, 1436–1449.